Objective To synthesise qualitative studies on women’s psychological experiences of physiological childbirth. Methods Studies exploring women’s psychological experiences of physiological birth using qualitative methods were eligible. The research group searched the following databases: MEDLINE, CINAHL, PsycINFO, PsycARTICLES, SocINDEX and Psychology and Behavioural Sciences Collection. We contacted the key authors searched reference lists of the collected articles. Quality assessment was done independently using the Critical Appraisal Skills Programme (CASP) checklist. Studies were synthesised using techniques of meta-ethnography. Results Eight studies involving 94 women were included. Three third order interpretations were identified: ‘maintaining self-confidence in early labour’, ‘withdrawing within as labour intensifies’ and ‘the uniqueness of the birth experience’. Using the first, second and third order interpretations, a line of argument developed that demonstrated ‘the empowering journey of giving birth’ encompassing the various emotions, thoughts and behaviours that women experience during birth. Conclusion Giving birth physiologically is an intense and transformative psychological experience that generates a sense of empowerment. The benefits of this process can be maximised through physical, emotional and social support for women, enhancing their belief in their ability to birth and not disturbing physiology unless it is necessary. Healthcare professionals need to take cognisance of the empowering effects of the psychological experience of physiological childbirth. Further research to validate the results from this study is necessary. Strict inclusion criteria were applied so that only studies where all women had unmedicated births were included. Some births had occurred more than 10 years before. Parity was not differentiated as a criteria. All selected studies came from high-income countries. All births were attended by midwives and a relatively large number of women included in this study had a home birth. Neurobiologically, childbirth is directed by hormones produced both by the maternal and the fetal brain.7 During childbirth and immediately after delivery, both brains are immersed in a very specific neurohormonal scenario, impossible to reproduce artificially. The psychology of childbirth is likely to be mediated by these neuro-hormones, as well as by particular cultural and personal issues. The peaks of endogenous oxytocin during labour, together with the progressive release of endorphins in the maternal brain, are likely to cause the altered state of consciousness most typical of unmedicated labour that midwives and mothers easily recognise or describe as ‘labour land’, but this phenomenon has received little attention from neuropsychology. The medical model has traditionally divided labour into stages according to mechanical or physical changes such as dilation of the cervix and descent of the head as depicted on the traditional Friedman’s curve or WHO partograph.21 However, the subjective, emotional experience of labour does not conform to these mechanical descriptions of the body’s changes. It is questionable that women experience specific stages or phases as traditionally described by professionals.22 Understanding the psychological experience in physiological childbirth can contribute to enhancing a salutogenic approach to health and can contribute to the promotion of healthy, happy family relationships in the longer term. The aim of this meta-synthesis is to locate and synthesise published qualitative studies that describe the psychological process of women during physiological childbirth, paying attention to the immanent psychological responses that emerge during the process of labour and birth. We hypothesised that there is a common psychological experience of physiological labour. We focus on labouring women’s thoughts and feelings, and the meanings they ascribe to their perceptions of childbirth process and the surrounding environment, as reaction to both childbirth and to the surrounding environment are part of a single psychological process. We refer to the psychological process in terms of the ‘lived experience’ and thus we adopted a Husserlian a phenomenological approach for the analysis of the data in the included studies. Patients and public were not involved in the design, conception or conduct of this study. A systematic search was conducted in March 2016 and updated in October 2017. The following databases were included: EBSCOhost, including the database MEDLINE, CINAHL, PsycINFO, PsycARTICLES, SocINDEX and Psychology and Behavioural Sciences Collection. The search terms are given in online supplementary appendix 1. (We used EBSCOhost for the complete search and therefore did not use MeSH terms.) Eligible papers were written in English, Spanish and Portuguese. Five groups of two authors independently read the abstracts and selected the articles, and the decision to include an article was achieved by consensus. When there was disagreement, a third author provided assistance and input. We searched reference lists of the included articles to identify additional articles that were relevant to the study question. We sought suggestions from experts in the field and articles from other sources. For the purpose of our study, physiological childbirth was defined as an uninterrupted process without major interventions, such as induction, augmentation, instrumental assistance, caesarean section as well as use of epidural anaesthesia or other pain relief medications. The inclusion criteria were (1) original research of (2) women who had physiological childbirth and (3) described their experiences and behaviours during (4) the whole process of childbirth. 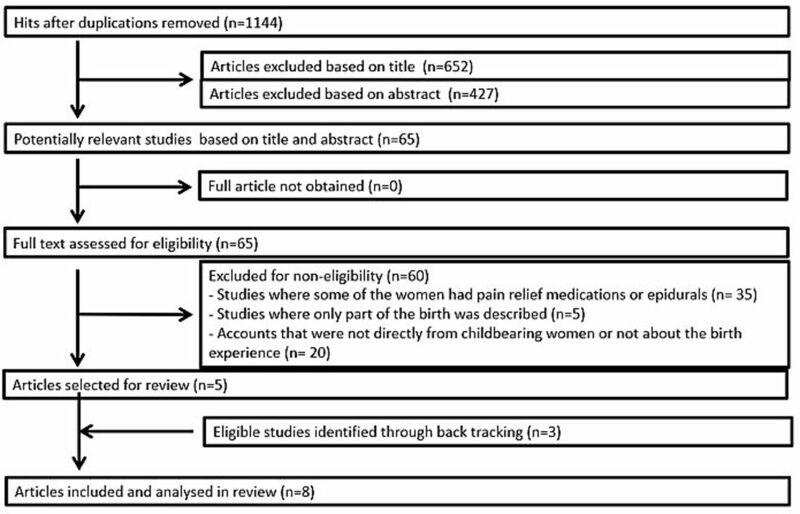 Studies were excluded, if the experience of childbirth was (1) described by any source other than the woman who experienced the birth (eg, from healthcare professionals), (2) described only a single stage in the birth process or (3) described births with major medical and surgical interventions (or pain management (eg, caesarean section). Data analysis included the following steps. The first order interpretation involved reading and re-reading all studies to become familiar with their content, feeling and tone. The first author (IO) conducted a line-by-line coding of the findings of all included studies. Quotes, interpretations and explanations in the original studies were treated as data. The coding categories included: feelings, behaviours (actions), signs (eg, pain, contractions), relations (midwife, partner, baby and relatives), time perception, cognitions (thoughts and knowledge) and location (home, water, places, transferring). Based on the emerging data, these coding categories were sorted into (1) early labour, (2) intense labour, (3) pushing, (4) baby out (immediately), (5) placenta and (6) evaluation of the whole birth experience. To achieve the second and third order interpretation, the research team reflected on the first order interpretations to identify the themes and subthemes that describe the emerging constructs grounded in the primary studies. This process included reciprocal (similarity) and refutational (contradictory) analysis which identified differences, divergences and dissonance between the studies and then to synthesise these translations. Following this reflection process, the research team used a line of argument to create a model that best explains the psychological process of physiological childbirth, as described in the included studies. To ensure the quality of the findings in the study, all selected papers were screened on the methodological quality using CASP29 and subsequently, all the included papers were assessed using consolidated criteria for reporting qualitative research (COREQ)30 to ensure they had reported all the relevant details of their methodological and analytic approach. Throughout the research process, the authors identified and explored their own views and opinions as possible influences on the decisions taken. This was done because of the subjective nature of qualitative research to protect the methodological rigour of the study. All the authors of this paper are part of an EU-funded COST Action specifically examining aspects of physiological birth. The research group have chosen to participate in the COST Action IS1405 Building Intrapartum Research Thorugh Health (BIRTH) because of strong interests in the importance of understanding physiological and psychological processes of childbirth, to enhance the capacity of women to labour and give birth normally where this was possible for them, and where it is their choice to do so. All the authors believe that birth is a profound physiological, psychological and socio-cultural experience for most women and babies. The research team included authors of multidisciplinary backgrounds. The contribution of each author, coming from different paradigms and perspectives on women’s needs in labour, ensured the interpretation of findings was grounded in the data and came from the data. The use of refutational analyses, as recommended by Noblit and Hare20 21 minimises the risk of overlooking information because it did not fit with the authors’ pre-conceptions. This strengthens the trustworthiness of this research. The search identified 1520 articles in EBSCOhost. There were 376 duplicates, which were removed, leaving 1144 unique articles in the sample. figure 1 demonstrates the selection process, which resulted in eight included studies. All of the selected studies met the quality screening and assessment criteria. Some papers had to be excluded because just one or a few participants did not have a physiological birth as defined for this study. CASP and COREQ assessments are detailed in the online supplementary files. The eight included studies involved 94 women, 28 primiparous and 22 multiparous women, although four studies did not identify parity in their sample. Of these, two studies had a mix of primiparous and multiparous women (half each)17 27 and two studies did not address parity for the sample at all.28 29 Most of the interviews took place within a year after birth, but some studies had longer intervals, and in two studies, women were interviewed up to 10 or 20 years after birth.11 31 One study did not identify a time interval between the index birth and the interview.32 Thirty-nine of the women gave birth at home, four in a primary care unit and 51 in hospital. It seems that midwives were the primary carers of these women. Further characteristics of the studies can be found in table 1. Three main themes emerged: maintaining self-confidence in early labour, withdrawing within as labour intensifies and the uniqueness of the birth experience. A number of subthemes were identified within each of the three main themes, which are listed on table 2. Themes, subthemes and studies contributing. This theme presents women’s experiences when they realised that they were in labour. The accounts indicated that women knew when they were in labour and most preferred to wait calmly for progress, maintaining confidence by keeping a familiar routine and environment. I felt confident by staying in my own living room (3, p724). Thought it was reassuring to be together with family in familiar surroundings (3, p724). When women recognised the beginning of labour, they shared it with other women. Usually they called their mother or sister, before calling the midwife or the hospital.12 13 Few asked their midwife to be with them at this point. At 10 o’clock in the morning I called the hospital. Of course, I had talked to my mom first (3, p274). I was lying all night and with my labour pains and my dog came and lay by my feet…it was an incredible feeling, it was in September, all the apples in the trees…it was all so silent… (31, p352). As the labour intensified, women withdrew into an inner world where time seemed to be suspended. Women described how this inner space allowed them to concentrate on the labouring process, and this facilitated the feeling that they could manage. The experience of control was complex and nuanced—for some, the sense of being in control was directed at making all of the decisions and for others, it was achieved by feeling safe enough to hand over control (or guardianship) to the midwife, so that they could retreat into their inner world of labouring. When contractions became stronger and pain intensified, women felt the need to be fully focused on the physical task.13 At this point women really needed to be with safe companions in a protected place. This was the moment to contact the midwife and/or move to the hospital. I’ve got to be somewhere where I can actually allow myself to feel what I am going through (13, p373). The pain experience was framed by accepting pain as a natural part of childbirth, and this was important for women.3 32 Two key elements in the response to pain were trusting in the body and working with pain.3 11 Mobility was important in this phase, and women needed to move around32 or submerge themselves in water.34 The following quote is an example of how women framed the pain experience to reduce fear. I don’t think it is explained very well what the pain is for. People just get frightened of the pain. If they could see it as something useful…the pain is there so as you can help them out, it’s not frightening at all (p58). Not having any experience of labour, I needed the midwife to tell me what to do. Because she was in control I felt I was too’ (34, p33). Women expressed their need for a caring approach.3 11 13 34 The support from midwives helped women to face the vulnerability they experienced during labour. Knowing the midwives so well makes you feel quite at ease, if you are scared and you haven t got anyone reassuring you, you are just panicking, and it hurts a lot more (33, p239). You are so incredibly vulnerable and I feel that you have such a need that someone is kind to you and shows you some interest. All your energy goes into giving birth to this child and you simply don’t have energy left to argue with someone or make a fuss about something. You almost have to take whatever your surroundings offer you (11, p52). All throughout she said to me: you are coping fine, Linda; I felt assured. That was how she was making me feel calm all throughout she said to me: you are coping fine, Linda; I felt assured. That was how she was making me feel calm (33, p239). They also described how important their partner was. I felt he was my lifeline, he had the best analgesic effect on me and he did not leave me once (31, p. 352). I felt like we were doing it ourselves, which was nice. We didn’t feel we needed the midwife all the time but she was there if we did (34, p34). Nothing else matters and the universe kind of shrinks to this particular, you know this particular job that you have to do which is you know about birthing your baby(13, p373). Like with both my labours, I took myself away. I need not to have people looking at me (12, p49). Women described perceptions of an altered or suspended sense of time. My sense of time was completely lost, as if I had forgotten it in a drawer at home. It was a very strange feeling. There are a lot of people around you and yet you are in your own world. Even if we were in the same room we were not in the same world…’(11, p52). I was so optimistic in the beginning of the latter birth…I had given birth before and I survived…so that you believe you will survive. However, in both births I had this feeling for some time that I would never survive this (11, p56). I was requesting for a caesarean, I was requesting for everything! Because I just wanted to get over with it. I just said I was going to die. At one point I felt like I was going to faint and stuff like that. I said: ‘Please Sandra, I want pain relief.’ I was actually begging her, ‘Please, please, please.’ I said, ‘I’m going to die! I won’t be able to do this! (33, p239). When I started to push, it was as if a curtain was drawn. A totally different perception, suddenly I was awake, alert and quite aware of timing’ (11, p55). … I was at the top of the mountain when I started to push. And then I had to get down again. And that was it! (3, p725). With the birth of their baby women described relief, joy at meeting their baby and sense of transformation. So I was brave, I was strong!… So I was like, ‘Yes, I have done it! Yes, I can do it!’ I was so happy. I honestly never had this kind of joy since I was born. I don’t know where this joy came from. I don’t know how to describe the endless joy that came in me (33, p239). What is most prominent in the birth experience as a whole is the sense of victory, the feeling of ecstasy when the baby is born. That feeling is unique, and in the last birth I was without all medication and therefore I could enjoy this feeling much better. Well, I enjoyed it completely (11, p57). Women described the intensity of their feelings of childbirth as being their greatest, unparalleled achievement. It is an intense experience, a powerful life experience. It is naturally magnificent that you, just to find that you are capable of giving birth, to a child, that you can do it. To be such a perfect being that you can do it…the feeling you get when you get your new born child into your arms naturally is indescribable. It is a feeling you cannot compare with anything else. It is awe inspiring11 (p56). Women also expressed feelings of spiritual closeness and gratitude. I had this holiness, being close to the universe. I feel such gratitude for the possibility to give birth at home (31, p350). I can’t really explain. I’m very pleased, very pleased, that I did it naturally. I feel so proud, full of myself. I am very proud to have him naturally. I am very proud even now. (33, p239). Women described the speed with which they assured themselves that their baby looked normal. I remember particularly that as soon as the baby is born you think incredibly fast and you look incredibly fast whether there are, without all doubts, ten toes and ten fingers and everything that is supposed to be in place is there and many other things.11 (p56). As soon as I had the baby I’d had my bath and everything and my mum and everybody arrived…we were all in the garden with the baby (32, p58). By three o’clock everybody had left except for just ourselves, the four of us, the whole family. We were just tucked up across my bed and I think in some ways that was the moment that felt that this is absolutely right. There’s nothing more right in the world. I was just all so peaceful. So why would do anything differently kind of feeling to it (29, p58). The birth of the placenta was only mentioned in one study.19 For some women, it was anti-climactic after the birth of the baby, while others considered it a part of the recovery process. …I felt I could sense right then, when minutes passed by. I felt that I (tearful) was a little bit different (11 p56). When you do that as a woman, you know you can do anything … I realised how everything else in life is easy, if you can do that (enduring 70 hours of no sleep, wild contractions, etc.) you can do anything. I am sad that so many women don’t get to understand this (12, p52). Constructing a line of argument is the next step in a meta-synthesis based on the first, second and third order interpretations. For this study, the line of argument demonstrated ‘the empowering journey of giving birth’, encompassing the various emotions, thoughts and behaviours that women experience during labour. Women’s psychological journey originated with telling other women from their social network that labour had started, while staying cocooned in a familiar environment. Most women focused on maintaining self-confidence at the start of labour and tended to withdraw into an inner world as labour became more intense. As birth progressed, women experienced an altered state of consciousness including a change in time perception and intense feelings such as fear of dying. Women described various ways of coping with the pain and keeping control, which paradoxically, included releasing control to the midwife where appropriate. With the urge to push, women felt that once again they became alert and more active. Immediately after the baby was born, feelings of joy and pride were predominant. The journey through childbirth meant a growth in personal strength. Some women described themselves as a changed person in the sense that they felt stronger, empowered and ready to meet the demands of the newborn. Our study offers new insights into women’s psychological experience of physiologic childbirth as a meta-synthesis on this topic has not been previously reported. We created a model of the emerging psychological pattern of this journey that is designated in terms of emotions and behaviours. Women described birth as a challenging but predominantly positive experience that they were able to overcome with their own coping resources and the help of others. For them, this resulted in feelings of strength to face a new episode in their life with their family. Our findings confirm our main hypothesis: there is a common psychological experience of physiological labour. As far as we are aware, this has not previously been reported using women’s accounts as primary data. Our findings suggest that birth is just as much a psychological journey as a physical one. Although the whole event does not seem to have been described before on the basis of qualitative evidence, elements of our findings are coherent with those from other studies. The preference for familiarity of environment and people at the start of birth,35 the altered state of consciousness,36 37 the different time perception,38–40 the empowerment6 41 42 and change37 43 that come with childbirth have previously been described. What this meta-synthesis demonstrates is the enormous importance of having maternity care providers, including midwives, at the birth that are compassionate and support women to keep a sense of control that is adjusted to their personal needs and wishes. Care providers can strengthen women’s sense of coherence in offering them emotional support, stimulating trust and confidence and supporting meaningful others to be there during the birthing process. Labouring women need to be able to create a trustful bond with the midwives and obstetricians attending them that offers reassurance and enables them to feel in control. It may be that women are more likely to experience a psychologically positive physiological birth when they feel that a supportive and compassionate companion or healthcare provider (in the case of the included studies, a midwife) is by their side, and is very sensitive and attentive to their cues. This includes effective responses when the woman needs them, and simple encouragement, information or support to reassure them that what is happening to them is normal. Such support may enable women to trust that they are safe to focus inwards, which facilitates the release of hormones and enables the maternal behaviours that are essential to progress a physiological labour and birth. Midwives and other caregivers, including obstetricians, can facilitate this process by demonstrating empathy, compassion and supporting a woman’s belief in her own ability to birth. These are key skills and competencies identified in midwifery-led care, recommended to be implemented worldwide.53 These affective skills should be included in midwifery, nursing and medical education so that all caregivers have the same expertise in the emotional care of women during birth. The studies included in this meta-synthesis were from high-income countries. The experiences of women in places with low-resourced maternity care systems may be different. Our sample was small and we lacked information on women’s parity, preparation for birth, specific details of supporting professionals, partners and significant others, which can be of major influence on women’s experience of childbirth. Positive, physiological labour and birth can be a salutogenic event, from a mental health perspective, as well as in terms of physical well-being. The findings challenge the biomedical ‘stages of labour’ discourse and will help increase awareness of the importance of optimising physiological birth as far as possible to enhance maternal mental health. The benefits of this process can be maximised through physical, emotional and social support for women, enhancing their belief in their ability to birth and not disturbing physiology unless it is necessary. Giving birth physiologically in the context of supportive, empathic caregivers, is a psychological journey that seems to generate a sense of empowerment in the transition to motherhood. The benefits of this process can be maximised through physical, emotional and social support for women, enhancing their belief in their ability to birth without disturbing physiology unless there is a compelling need. Healthcare professionals need to understand the empowering effects of the psychological experience of physiological childbirth. Further research to validate the results from this study is necessary.
. Facilitating women’s choice in maternity care. J Clin Ethics 2013;24:276–82.
. Birth trauma: in the eye of the beholder. Nurs Res 2004;53:28–35. World Health Organization. WHO recommendations: intrapartum care for a positive childbirth experience. WHO 2018.
. Meta-ethnography: synthesizing qualitative studies. Newbury Park: SAGE, 1998. CASP. Critical Appraisal Skills Programme (CASP). (Qualitative checklist). http://www.casp-uk.net/casp-tools-checklists (accessed Oct 2017).
. Women’s experience of planned home birth: a phenomenological study. RCM Midwives 2002;5:56–9. Contributors All authors conceived and designed the study. MN and PL-W organised and conducted the search. IO, PL-W, YB, MNJ, EC-M, AS, MK, LT, MM and SSJ participated in the selection of the relevant articles. IO and EC-M performed the quality assessment of the studies. IO did the data extraction from the studies and drafted the manuscript. IO, PL-W, YB, MNJ, AS, MK, SSJ, SIK, PJH and SD interpreted the results, critically revised the manuscript for important intellectual content, and contributed to and approved the final version. MNJ, SD and PL-W supervised the project. YB, PJH, SD, MK, PL-W, MNJ and IO made the changes and corrections suggested by the reviewers. Funding Eu cost action is 1405 birth: Building intrapartum research through health (http://www.cost.eu/COST_Actions/isch/IS1405). Ethics approval Ethical approval was not required for this meta-synthesis. Data sharing statement Additional unpublished data only available with authors.